It's the end of the school year, so I thought I'd make something special for lunch today. 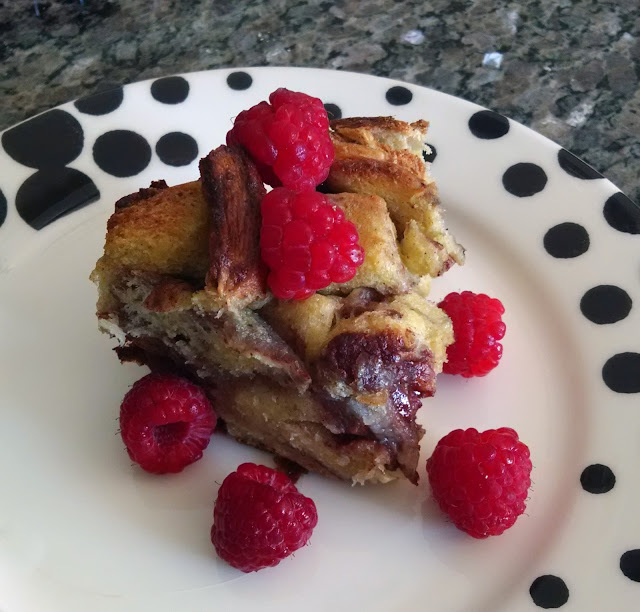 Cinnamon Roll French Toast Casserole is what I came up with. Mainly because I had a loaf of cinnamon roll bread in my fridge and I used it to make French toast a couple of days before and it just begged to be all mixed together into one large delicious bite. Cover (either lid or foil) and store in the fridge overnight. The next day, when ready, bake covered on 375º for about 30-45 mins until the middle is set (the bread should look like a moist cake, not a wet sponge). Remove the lid (or foil) in the last 10 minutes to brown the tops. Serve with maple syrup and berries. Or, if you used the cinnamon rolls, you can use the sugar frosting provided. *You can also add berries, such as blueberries or raspberries into the batter. About 1C should do it.